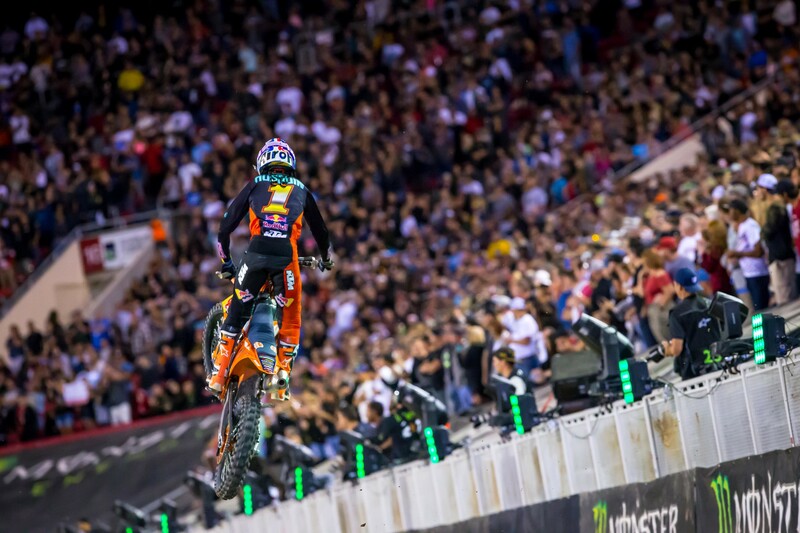 A year ago, Marvin Musquin could do no wrong at the Monster Energy Cup, jetting away for three race wins to net the Monster Million-dollar bonus. This year the Red Bull KTM man couldn’t get anything to go right. He finished second to Eli Tomac in race one, but got stuck with Chad Reed in race two, and then hit in turn one in race three, ending his night early. We caught up with Marvin in the pits after the race to get his take on the night. By the way, Marvin has endured plenty of criticism from the Monster Energy Kawasaki team ever since the 2017 New Jersey Supercross, when he moved over to help teammate Ryan Dungey win the event and score maximum points. This time, it was Monster Energy Kawasaki’s Joey Savatgy making life easy on Tomac, which helped Eli get the three-race sweep and the Million dollar pay day. This fact wasn’t lost on Marvin. Racer X: So what happened in that third race. I think maybe you got hit by Mookie from the inside or something? Marvin Musquin: I don’t know. My starts were decent but not great enough to win. But then the last moto I just wanted to win. In the first turn I thought I was pretty decent toward the inside and safe, but then I just heard a big “Brap!” and we hit. We went kind of the opposite way, instead of going left we went right, and then we were done. So you were messed up or was the bike messed up or what? The whole thing was kind of messed up! [Laughs] But to be honest I was happy about practice, we were the fastest. I was happy with my riding technique. But then you have to get the start, and that race is crazy. Last year was awesome, I put myself in a better position right away, but this year I didn’t. Once again, I only had a couple of rides to get ready for this race. It’s not easy, but I felt like I was ready in the short time I had—but yeah, it definitely didn’t go my way today. First moto I was happy with second, I made passes on a tough track to make passes. I got second, then second moto I was on my way to kind of do the same thing, but unfortunately Chad Reed had an issue and I couldn’t avoid him. I was committed and I got stuck with him, but thanks to him he didn’t try to run away with my leg stuck in his wheel. My leg was stuck between his wheel and fender. He saw it and he didn’t try to pull away. Thank you, Chad! It’s funny how this race works. One year it’s all you and the next year you don’t catch any of the breaks. Yeah. My goal was to win the overall again, winning all three is very tough, but I wanted to get an overall. But unfortunately we had so many race incidents. I’m glad I’m safe because it’s a crazy race, intense, and high speed. That sand section is so tough. I mean, you’ve got to be sharp, you have to be focused. That sand section was tough. Eli had to pass seven dudes to get the million in the last race. Are you so happy you didn’t have to go through that to get it last year? Yeah for sure, last year I put myself in great position. Yeah, I definitely see some team tactics out there, [Savatgy] putting his arm out to show him [Tomac]. But I knew it coming up, yeah, for sure his teammate will let him by. They can’t talk about it [team tactics] anymore I guess!